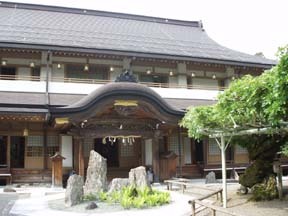 Temple Lodging in Japan "Soji-in"
Although I did not stay there, I accompanied a video shooting for a TV program as a guide. 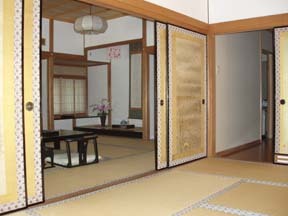 This shukubo features barrier-free construction. A wheel chair can be lead from the underground parking lot to the inside of the building by an elevator. (Note that the parking place has a narrow entrance. A big car may have a little difficulty getting in.) In the newly built guestrooms, there is no difference in level and they are equipped with a bathroom. There is space for caregivers in the bathroom. 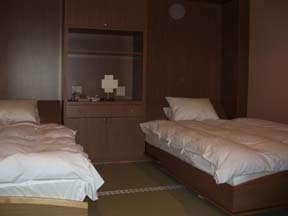 A table for meals as well as a bed is provided in the room so that even people who have bad knees can stay in comfort. 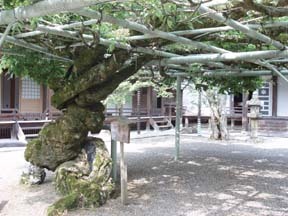 The shukubo is not only new but they keep good old things. 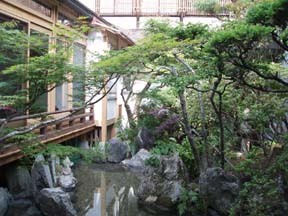 For example, the building is made from timber and outside the window you can see water and the green garden, thus the shukubo also enables you to enjoy Japanese style taste. 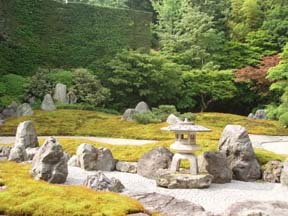 Another big feature is the shojin vegetarian cuisine. Their creative and positive approach is to always introduce new things, not solely depending on existing items. For example, they serve Italian shojin pasta with plum sauce, Chinese style baked rice and French style raw spring rolls, which are difficult to find any other place. The vegetables they serve included unordinary ingredients such as Magic Red which is a little hot. Even their Japanese food offered something new: Warabimochi or bracken-starch dumplings in miso soup and sesame tofu tempura. With the sweet and sour taste of lily bulbs with plum flesh and hotpot seasoned with white miso and sesame tofu, it was truly creative cuisine. We felt their progressive attitude to mix tradition and freshness, not only in the rooms, but also in the foods. I am the one who asked about barrier free shukubo previously. The room that I stayed in was on the second floor. There is an elevator, so it was convenient. Thanks to the walls separating the rooms and the sound-proof windows, I was able to spend a quiet time. The room can be locked and there is a small safe is provided. The room has a western style restroom with a bidet. Because there is a small heater, the room was kept warm even in the winter. The room has minor steps, so it might be difficult to use for a person in a wheelchair. The meals were, I think, reasonable. 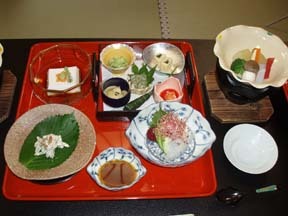 (Maybe I am less generous because the shukubo that I had stayed at before served really gorgeous and tasty meals.) In addition to a yukata robe, a towel, a shower cap, cosmetic cotton and hair bands are included in a small bag. The bath was really neat and comfortable. The other guests seemed to have taken a bath before the meal. I had the bath all to myself after dinner. Both towels and driers are also provided in the bathroom. You are free to participate in the service from 6:00 in the morning. You are able to listen to the sermon of the priest.